Easy to make and bake, this pound cake will definitely one of the easiest cake to prepare and bake easily at home. And this pound cake batter calls for one bowl method. 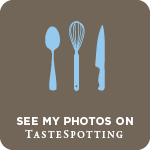 Yes beat everything one by one and the batter gets ready in few minutes when compared to other spongy cakes. Usually i love to bake French pound cake which doesnt calls for leavening agent, but this pound cake is baked with baking powder. However if you want a super rich cake for a special day or for a celebration, one should definitely give a try to this succulent spongy and very buttery cake. Preheat the oven to 350F and grease a loaf pan, keep aside. Beat the eggs and sugar until the mixture turns creamy. Add the butter and beat well for a while. Add the milk and beat well. Meawnhile sift the flour with baking powder and keep aside. Now add the dry ingredients to the wet ingredients.Fold in the glaced cherries. Mix well and pour the batter to the prepared pan. Bake for 40-45 minutes or until a toothpick inserted comes out clean. Remove the pan from the oven, let it cool completely. 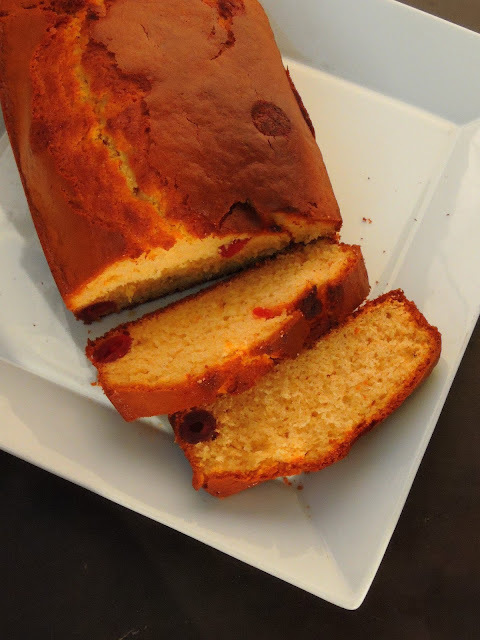 The pound cake with glazed cherries look fantastic Priya. My mom used to make pound cakes and I loved them while growing up. I haven't yet tried them frequently but the number of times I tried they turned out perfect. Next time will try adding some cherries in the batter. Love the addition of cherries to the pund cake. The cake looks super perfect. Very interesting addition of cherries in the pond cake. My kids love the pound cake. Your bake looks so tempting.. pound cake is my family's favorite.. loved the texture of your cake!! 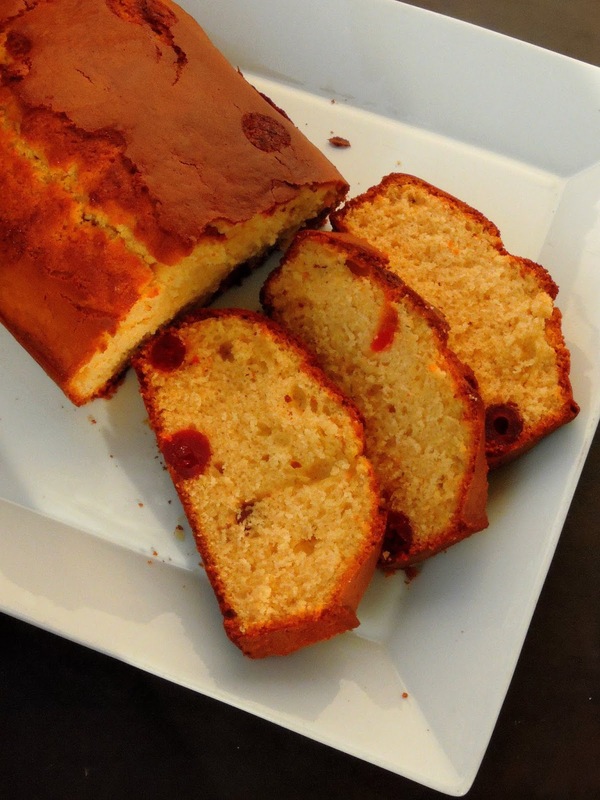 what a lovely tea cake with cherries - looks delicious! 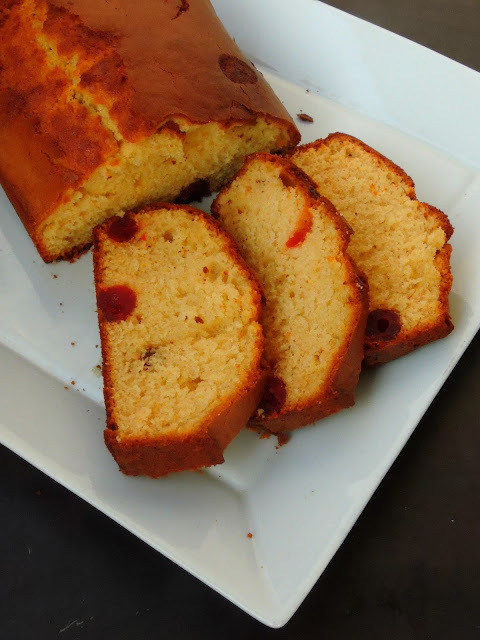 This is the season for loaf cakes and this pound cake with the cherries looks so festive. 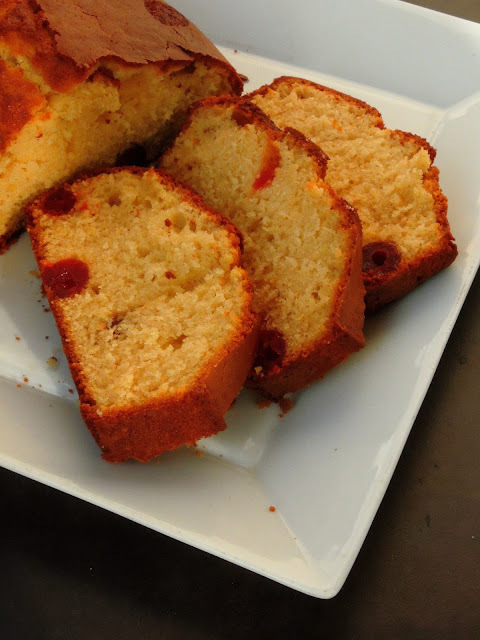 I love pound cake and my husband loves cherries. This will be finished by both of us in no time. The pound cake looks stunning Priya, love the texture..so good!